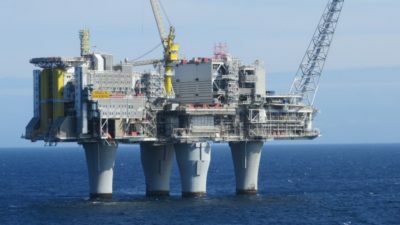 Norway’s newly renamed oil company Equinor and its partners announced more huge new investment in their large Troll oil and gas field in the North Sea on Tuesday. With oil prices rising, the plan calls for extending the field’s lifetime and tapping its value for all it’s worth. The Troll field, located around 65 kilometers west of Kollsnes in Hordaland County, sprawls over four blocs in the northern portion of the North Sea and consists of three oil and gas “provinces.” It has long been considered one of the most valuable on the Norwegian Continental Shelf (NCS). Its value is about to be tapped further, to the tune of NOK 7.8 billion (nearly USD 1 billion). The investment is aimed at securing earnings from the field that was discovered in 1979, expanded in the 1980s and been pumping up revenues of around NOK 175 million per day since 1995. Even after the last 20 years of production, an estimated 65 percent of Troll’s gas remains. Troll has also been the biggest oil producer on NCS for the past five years. Gas is produced from its Troll Øst reservoir and Troll A platform, while oil from the Troll Vest reservoir is produced from the Troll B and Troll C platforms. 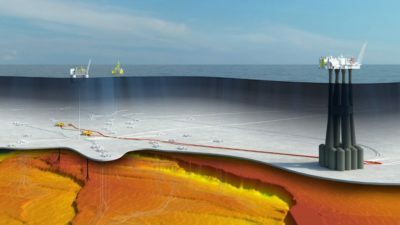 The field is owned and operated by Equinor (the former Statoil) with its 30.58 percent stake along with the state’s Petoro with 56 percent. Partners include Norske Shell, with 8.1 percent, Total E&P Norge with 3.69 percent and ConocoPhillips Skandinavia with 1.62 percent. They’re now all keen to get even more out of Troll and extend its operations until around 2050. Gunnar Nakken of Equinor called the investment project “strategically important” in terms of energy needs versus the need to minimize emissions and address climate concerns. While environmental advocates generally oppose most oil and gas production, enhanced production from existing fields is preferred over exploration and entirely new drilling projects, especially those in sensitive Arctic areas. The Troll A platform also already operates with electricity from the mainland, which has left it with record-low carbon emissions of around 0.1 kilos CO2 per barrel, according to Nakken. That compares to average emissions of 17 kilos of CO2 per barrel. Plans for Troll’s third phase are expected to extend the field’s production for another 17 years, and yield values that are more than double what Troll already has produced over the past 20 years. Cash flow generated by the field is expected to amount to around NOK 1,650 billion. The development plan for Troll was formally delivered to state authorities at the Oil & Energy Ministry Tuesday morning. It calls for construction of new subsea construction tied to the Troll A platform, including the drilling of eight new production wells, new pipes and installation of a process module on Troll A. The construction will also be powered with electricity from the mainland. Aker Solutions won contracts for the subsea equipment and process module earlier this year. Equinor was signing contracts on Tuesday for more subsea equipment and marine installations worth NOK 750 million with the companies Allseas, Nexans and Deep Ocean. The project is also expected to generate many new jobs over the next several years.